We've learned a lot about the planet Jedha, which will appear in the upcoming film Rogue One: A Star Wars Story, over the past few weeks. First revealed at Star Wars Celebration, the planet has been compared to real world locations such as Mecca and Jerusalem and is said to be a place of great spiritual importance. It is also apparently a place of great interest to The Empire, who is actively suppressing religion and the Force in this era. 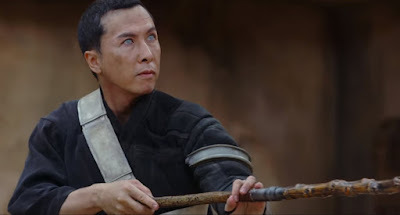 The reason for their interest is still a mystery, however Rogue One star Donnie Yen (Chirut Imwe) may have dropped a huge clue. Yen seems to confirm the rumor that the Empire is mining Kyber Crystals on Jedha. Although Yen doesn't actually say Kyber Crystal, director Gareth Edwards told Entertainment Weekly earlier this week that, "There’s something very important in Jedha that serves both the Jedi and the Empire." Seeing as Kyber Crystals are used to power both lightsabers and the Death Star, it certainly seems that what's Edwards is referring to. Don't forget, a new Rogue One trailer drops tomorrow during Olympic coverage!